She’s almost as big as the shark from “Jaws” — except she’s real. 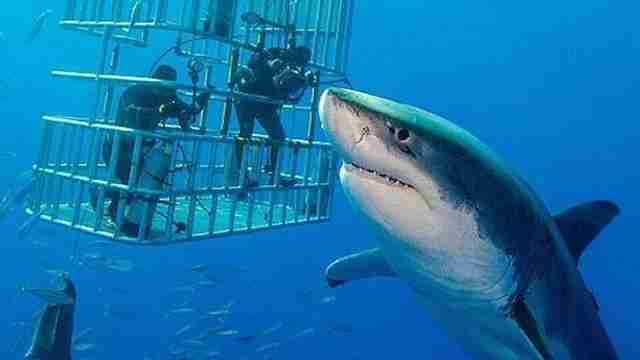 Her name is Deep Blue — and at 20 feet long, she’s thought to be the largest great white shark ever caught on film. Conservationist Mauricio Hoyos Padilla was face-to-face with the now-famous great white back in 2015 while filming for Discovery Channel’s Shark Week. That’s because they’re likely to be killed before they ever grow as old and massive as Deep Blue, due to environmental pollution, illegal shark hunting and fishing bycatch. After being discovered and tagged during the filming, Deep Blue has been quite elusive in the years since. Hoyos Padilla says it’s possible he caught another glimpse of her in January — but the shark swam away into the darkness before he could get a good look. If that was any indicator, maybe that’s how Deep Blue has grown so old and large: She simply avoids people. To help protect sharks in the wild like Deep Blue, you can make a donation to Sea Shepherd.